A year ago, Excela Heath in Greensburg, Pa., was the center of an overstenting controversy. 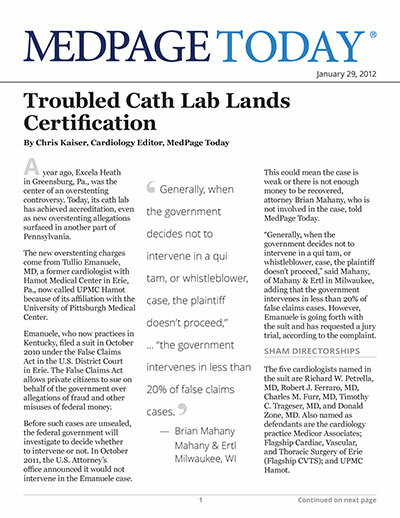 Today, its cath lab has achieved accreditation, even as new overstenting allegations surfaced in another part of Pennsylvania. The new overstenting charges come from Tullio Emanuele, MD, a former cardiologist with Hamot Medical Center in Erie, Pa., now called UPMC Hamot because of its affiliation with the University of Pittsburgh Medical Center. Emanuele, who now practices in Kentucky, filed a suit in October 2010 under the False Claims Act in the U.S. District Court in Erie. The False Claims Act allows private citizens to sue on behalf of the government over allegations of fraud and other misuses of federal money. Before such cases are unsealed, the federal government will investigate to decide whether to intervene or not. In October 2011, the U.S. Attorney's office announced it would not intervene in the Emanuele case. This could mean the case is weak or there is not enough money to be recovered, attorney Brian Mahany, who is not involved in the case, told MedPage Today. "Generally, when the government decides not to intervene in a qui tam, or whistleblower, case, the plaintiff doesn't proceed," said Mahany, of Mahany & Ertl in Milwaukee, adding that the government intervenes in less than 20% of false claims cases. However, Emanuele is going forth with the suit and has requested a jury trial, according to the complaint. The five cardiologists named in the suit are Richard W. Petrella, MD, Robert J. Ferraro, MD, Charles M. Furr, MD, Timothy C. Trageser, MD, and Donald Zone, MD. Also named as defendants are the cardiology practice Medicor Associates; Flagship Cardiac, Vascular, and Thoracic Surgery of Erie (Flagship CVTS); and UPMC Hamot. The complaint alleges that from at least 2001 to 2005, the defendants performed unnecessary diagnostic and interventional cardiac catheterization procedures and other vascular surgical procedures, and that they improperly billed or overbilled for services. The suit also claims that Hamot entered into a series of contracts with Medicor, Flagship CVTS, and other physicians to pay kickbacks to induce patient referrals. For example, the suit alleges that six sham directorships were created, each paying $75,000 a year. Emanuele claimed that in 2004 he began to notice higher rates of interventions among certain physicians in the group. "During the period from April 2004 through February 2005, the cath lab activity records show that 4,408 catheterizations were performed and that Drs. Petrella, Trageser, and Ferraro had a rate of surgical intervention following catheterization of double the junior members of the group," according to the complaint. Emanuele also said the defendants continued to perform cardiac cath procedures on the sole basis of stress testing even though Hamot had previously identified a problem with frequent false-positive readings on stress tests. One patient who Emanuele alleged received unnecessary bypass surgery later died from complications resulting from the surgery. Whistleblowers in such cases are entitled to a portion of the the fines the government collects. Emanuele's suit follows several high-profile overstenting cases in Maryland, including that of Mark Midei, MD, whose medical license was revoked in July 2011, and John Mclean, MD, who was convicted last July on on six counts of insurance fraud for implanting coronary stents that weren't needed, among other charges, and sentence to eight years in prison. The Department of Justice announced in May 2011 that it would intervene in a Tennessee case filed in 2007 by cardiologist Wood Deming, MD, against cardiologist Elie Hage Korban, MD, radiologist Joel Perchik, MD, and executives of Jackson-Madison County General Hospital and the Regional Hospital of Jackson in Jackson, Tenn. The good news is that hospitals beset by overstenting problems can turn themselves around. Such is the case with Excela Health. "It clearly takes a huge commitment at all levels of the institution," Jerome Granato, MD, Excela's chief medical officer, told MedPage Today. Granato began his tenure at Excela Health in January 2011, about a year after the first red flags were raised regarding potential inappropriate stent utilization. In 2010, someone suggested that several cardiologists at Excela had higher stenting utilization than others. The hospital initiated an external statistical review of all cardiologists and two of them stood out: Ehab Morcos, MD, and George Bousamra, MD. The hospital then enlisted 10 expert cardiologists from across the U.S. to review every case of each of these physicians. "We wanted to remove any sense of bias and of politics," Granato said. Out of 1,300 cases, the team of outside cardiologists identified 191 "where stent utilization may have been inappropriate." The patients were notified, as were the appropriate governing bodies including the Office of the Inspector General, Granato said. In January 2011, the two cardiologists voluntarily resigned their hospital privileges at Pittsburgh's Westmoreland Hospital, although they still remain part of the cardiology group. The hospital is currently dealing with more than 70 lawsuits filed on account of the unnecessary stenting. "Our brand was tarnished and it was important that we acted quickly to restore quality and confidence in our services," Granato said. By April 2011, the cath lab had new leadership and the hospital sought Accreditation for Cardiovascular Excellence (ACE), a program sponsored by the Society for Cardiovascular Angiography and Intervention (SCAI) and the American College of Cardiology (ACC). By the end of the year, the cath lab achieved ACE accreditation, the first in Pennsylvania and the seventh overall in the U.S.
"The accreditation process implements standards related outcomes such as mortality and complications, but also standards geared toward processes such as quality metrics, including random case reviews that not only examine quality but also appropriateness," Bonnie Weiner, MD, chief medical officer of ACE and director of interventional cardiovascular research at St. Vincent Hospital in Worcester, Mass., told MedPage Today. For example, if ACE reviewers see a borderline lesion on an angiogram that was stented without any other corroborating evidence of its ischemic nature, they will note that the interventionalists should have used fractional flow reserve, intravascular ultrasound, or some other method to confirm the necessity for stenting. Consequently, the reviewers will label it as questionably appropriate, Weiner said. The documentation is scrutinized, as is image quality, and also whether the procedure adheres to appropriateness criteria. ACE reviewers also want to ensure physicians are being treated fairly and that a system is in place to quickly and judiciously respond to issues should they arise, Weiner said. Hospitals must be re-certified every two years. Within the first year of certification, ACE reviewers contact the hospital at six months and one year to gauge progress. "We continue to interact with them on a corrective plan," Weiner said. The beauty of the ACE program, Granato said, is that it allows them to be proactive rather than reactive. "Most peer review processes are retrospective. If someone dies, we generally look to see what went wrong. But now we look at every case every day. If there is, for example, excess contrast media used or three stents for one case or more radiation time, we want an explanation the next day, not quarterly," he said. In addition, the hospital has established bipartisan committees that randomly select cases for review to ensure guidelines are being followed. Last year, representatives from SCAI and the Maryland chapter of the ACC petitioned the Maryland legislature in a letter to enact more stringent internal and external review processes in its proposed plan to regulate stent procedures, such as the type of review processes Excela underwent and implemented. The letter said that the high-profile overstenting cases in Maryland were the result of inadequate voluntary review.